Video (above) of one of the practical demonstrations during Technical Days 2016. 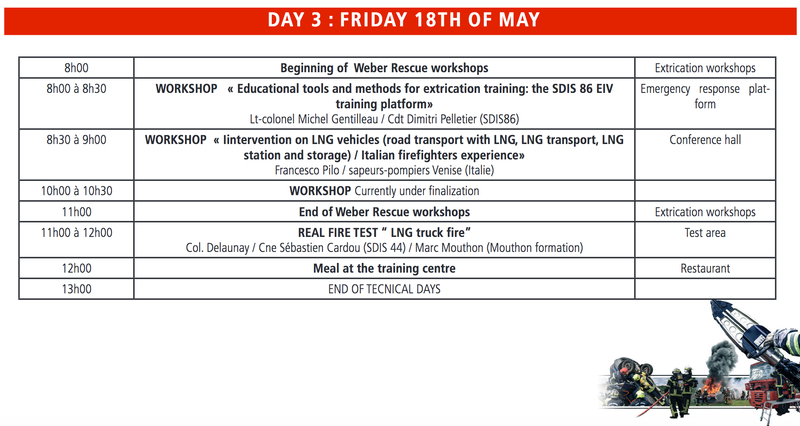 Technical Days in France offers an extensive three day program in French and English with demonstrations and lectures on Extrication for both Traditional and Alternative vehicle types. CTIF´s President Tore Eriksson are among the key note speakers during this event. 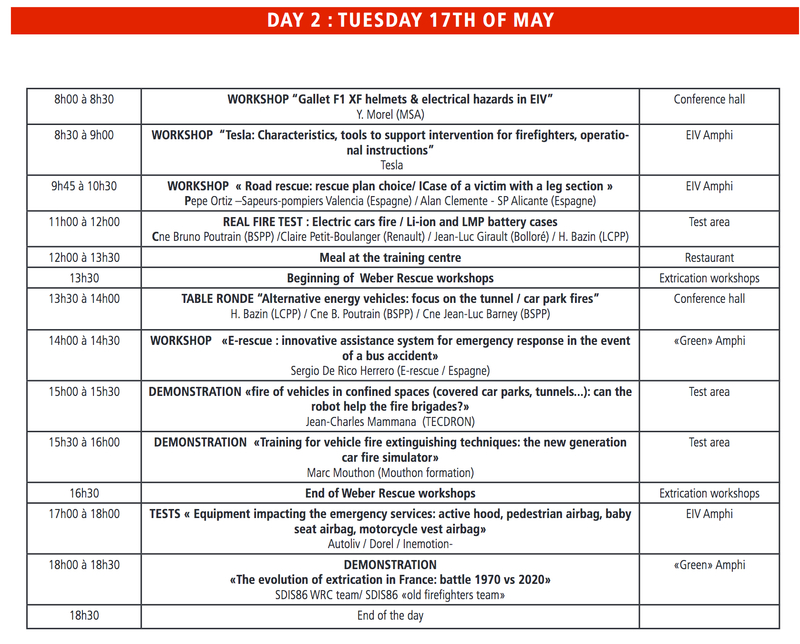 The 3rd edition of the Technical Days "Emergency Intervention on Vehicles" will take place on 16,17 and 18 of May 2018 at the site of the Vienna Fire Training Centre. The full Program for Technical Days 2018 can be accessed here, or by viewing the Photo Gallery below in this article. The SDIS 86, aware of these challenges, has initiated a proactive approach since 2005, in partnership with automobile manufacturers and manufacturers of road rescue equipment. An intervention protocol has been drawn up and training courses are offered at the Vienna Fire Training Center. In parallel to this approach, SDIS 86, in partnership with SDIS44, the National School of Fire Brigade Officers and the Fédération nationale des sapeurs-pompiers de France, the Directorate General of Civil Security and Crisis Management, the International Fire Technical Committee and the support of Weber-Rescue Systems and Renault, organized technical days on its site at the training center in 2014 and 2016. During the last edition of Technical Days, in 2016, nearly 450 people (participants, exhibitors, speakers, etc.) from 58 French departments and 14 different countries were present to attend the conferences, workshops and scheduled practical demonstrations. 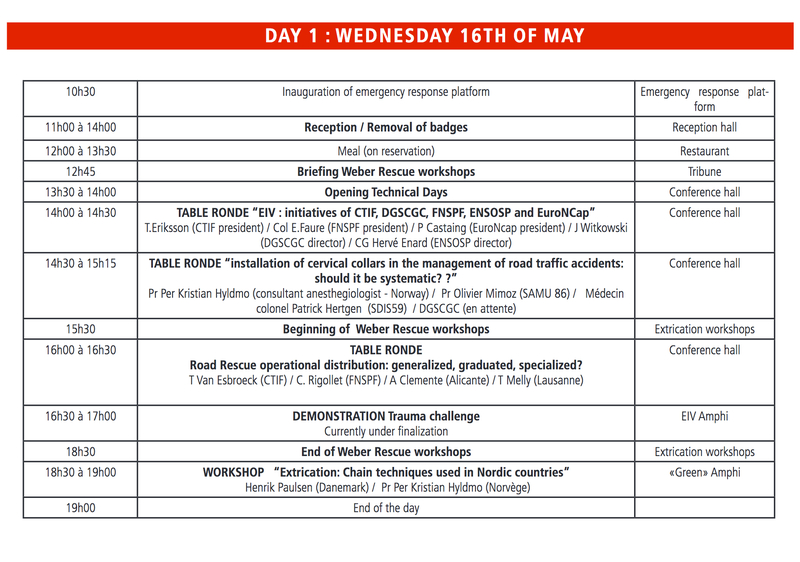 In partnership with WeberRescue Systems, the participants will take part in various thematic workshops (new technology vehicles, Cross-Raming, PL vehicles, buses, etc.) supervised by European trainers. On defined themes, international specialists will draw up an inventory of their work, their practices and future developments. Vehicle fire tests will be carried out. The opportunity to discover, in practice, the protocol for emergency intervention on vehicles. In the outdoor area, the different manufacturers of rescue equipment will present their tools and innovations. Vehicles will be made available to discover and test the equipment. In the interior space, all the tools necessary for road rescue operations will be present (individual and collective protection equipment, glazing management tools, tools for extracting victims, markings, lighting, etc.). The Participants´Guide can also be downloaded here below.